Sean’s birthday was last week and he had a little get together with some of his buddies this past weekend where they hung out, played video games, watched movies and ate a ton of food. Besides the pizza that we ordered from our local pizzeria, I also made a few things for the guys to eat while they were playing. It was a finger food kind of party so that everything could be eaten easily without interrupting the flow of their gaming. Of course no Sean party is ever complete without his all-time favorite – cheese fries. Sean has been loving cheese fries since he was a little kid and we pretty much have to order them out wherever and whenever we go someplace so it seemed only natural that I would make some for the party. Cheese fries don’t really need much of a recipe, but I did get this one from Rachel Ray because she makes use of a really great tasting cheese sauce to go over the fries to top them off. Place the french fries on a baking sheet lined with aluminum foil and cook the fries according to the directions on the package. While the french fries are baking in the oven, prepare the cheese sauce. Place a large saucepan set over medium heat and add the butter. Melt the butter until it stops bubbling and then add the all-purpose flour. Stir the flour and butter together for about 1 to 2 minutes to create a roux. Use a whisk to stir as you pour the milk into the pot. Keep stirring continuously until the milk begins to thicken, about 2 to 3 minutes. Use a wooden spoon or heat-safe spatula to stir in the cheese to the milk mixture. When all of the cheese has melted take the sauce off the heat. Remove the french fries from the oven and place them in a bowl or on a serving platter. Cover the fries with the warm cheese sauce and serve, with extra sauce on the side. This is a fast and easy recipe that kids of all ages seem to love and they can easily help you with this one in the kitchen as well. You can always add extra toppings to the fries if you want to shake things up. Try adding some sliced scallions, crumbled up pieces of bacon (a Sean personal favorite) or even some jalapeno peppers or other peppers if you want to make them a little spicier. 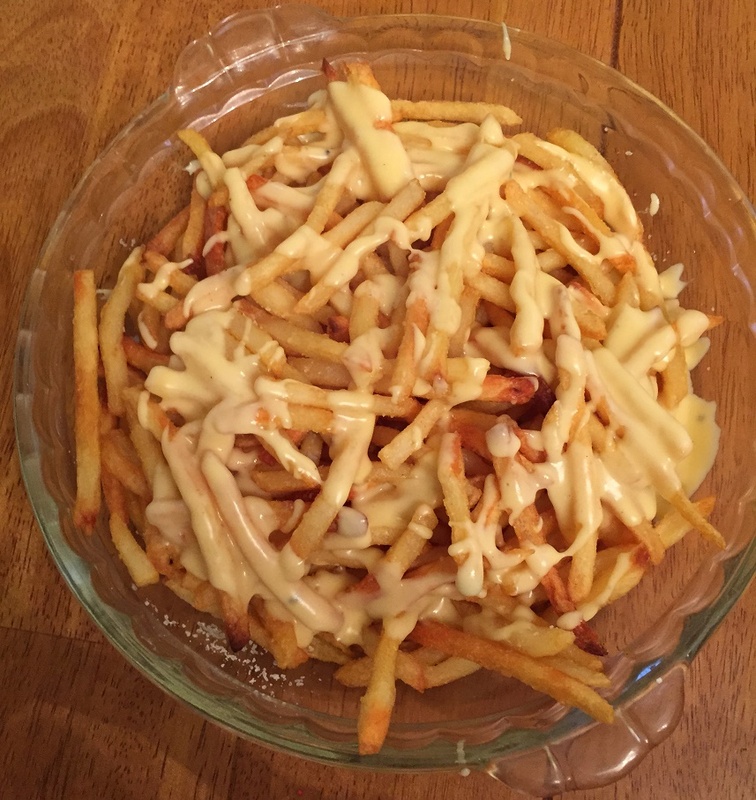 You could also put some herbs or spices on the fries before you add the cheese sauce if you want some different flavors or try using different cheeses to get a bit of a different flavor to the dish. It’s a great party snack that you can put together pretty quickly with just a couple of ingredients and all of the kids really liked this one.